Pistachios are a unique fruit tree to consider for your home garden. Because these trees are dioecious, you will need both a male and a female specimen in order to produce fruit. The best producing pistachios available are ‘Peter’ (Male) and ‘Kerman’ (female). Trees begin flowering in late March thru April, then are cross- pollinated by the wind. Fruit develops in red clusters, resembling grapes, and are mature and ready to eat around the end of August into September. In order to have best production it is important to note that you’ll need a minimum of 1,000 chilling hours in your area. Though this tree can tolerate warmer zones, it will not produce well in those zones unless the required chilling hours are met. 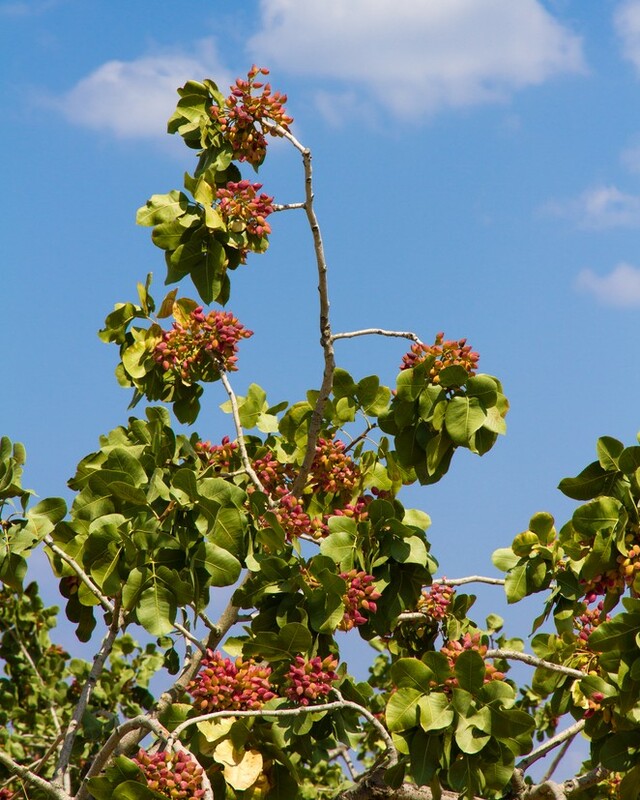 Pistachios will begin producing by the 4th or 5th year, but best production will occur around the 8th or 10th year. At maturity, pistachios can produce up to 80 pounds of mature fruit per year. Pistachios do best in regions that have hot dry summers with cold but moderate winters; but they do not tolerate humidity. They need well-draining soil and a full sun location to thrive.